Welcome to a fine collection of the Book of Creation- Sefer Yetzirah (Sefer Yetsirah, Sefer Yesirah, Sefer Yezirah). These products are through our affiliation with amazon.com and Barnes and Noble, so you can purchase in confidence through our web site. 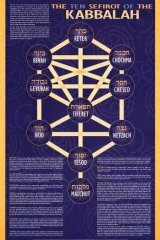 All purchases help support our site to provide more Kabbalah and other information through Entertainment Magazine.